Vanguard must be doing something right though, as they have more assets under management than any other mutual fund company, and growing every day. Therein lies the issue with the court’s decision-dismissing the ERISA action based on a fund’s business model, rather than the inherent value, if any, provided to a plan’s participants by an actively managed fund compared to a less expensive index fund, in this case Vanguard index funds. The purpose of ERISA is supposedly to help protect American workers’ retirement plan benefits and to help them work toward “retirement readiness.” As a result, it would seem that providing plan participants with effective investment options would be in the best interests of both plan participants and plan sponsors. As the Supreme Court stated in their decision in Tibble v. Edison International2, the courts often look to the Restatement (Third) of Trusts (“Restatement”) for guidance on fiduciary matters, especially involving ERISA. Three sections from the Restatement stand out with regard to the fiduciary duty of prudence. Section 88, comment b, of the Restatement states that fiduciaries have a duty to be cost-conscious. Section 90, aka the “Prudent Investor Rule (PIR),” comment f, states that a fiduciary has a duty to seek the highest rate of return for a given level of cost and risk or, conversely, the lowest level of cost and risk for a given level of expected return. Section 90, comment h(2), goes even further regarding a fiduciary’s duty to be cost-efficient, stating that due to the extra costs and risks typically associated with actively managed mutual funds, such funds should not be recommended to and/or used unless their use/recommendation can be “justified by realistically evaluated return calculations” and can be “reasonably expected to compensate” for their additional costs and risks. However, analyzing an actively managed fund based on return is only half the needed due diligence process. Reading the three referenced Restatement sections together, the Restatement requires that a mutual fund should be cost-efficient, should provide a level of return commensurate with an actively managed fund’s additional costs and risks. Consistent underperformance, coupled with significantly higher fees than comparable index funds, results in most actively managed mutual funds not being cost-efficient, which is clearly inconsistent with the Restatement’s fiduciary standards. In the recent court decision, the court’s position was that using Vanguard index funds for benchmarking would be like comparing “apples-to-oranges” due to the difference in the fund families’ business model. Nowhere in the decisions was there any discussion of the cost-efficiency of the funds or the actual end-return benefit or value, if any, realized by the plan participants. Unfortunately, the evidence from past and present ERISA actions suggests that more often than not, investment fiduciaries are recommending and pension plan fiduciaries are selecting investment options that are inefficient, both in terms of cost and/or risk management, and thus imprudent. Several years ago I created a metric that factors in all of the key criteria set out in the Restatement and the PIR. InvestSense’s proprietary metric, the Active Management Value Ratio™ 3.0 (AMVR), is designed to allow investors, fiduciaries, and attorneys to evaluate the cost-efficiency, or the relative value, of actively managed mutual funds. The AMVR is based in part on my experience as a securities compliance director at several broker-dealers. The AMVR is also based on the principles set out in the Restatement and the PIR , as well as the studies of investment icons Charles D. Ellis and Burton G. Malkiel. Does the actively managed mutual fund produce a positive incremental return? If so, does the fund’s incremental return exceed it incremental costs? If the answer to either of these questions is “no,” then the fund does not qualify as cost-efficient under the Restatement’s guidelines. However, RGAGX has a very high R-squared rating of approximately 95, definitely in an area considered to constitute “closet index” fund status. As a result, RGAGX has a high AER score, resulting in the fund’s incremental costs significantly exceeding the fund’s incremental return, and thus not cost-efficient. RGAGX also fails the cost-efficiency standards, both in terms of its nominal and risk-adjusted numbers. RGAGX’s incremental return only accounts for 7 percent of RGAGX’s risk-adjusted return At the same time, RGAGX’s nominal incremental cost constitutes 81 percent of RGAGX’s total expense, while its AER-adjusted incremental cost constitutes 98 percent of the fund’s total expense. Funds whose incremental costs are greater than their incremental return are not cost-efficient. In our forensic fiduciary analyses, we then analyze the surviving cost-efficient funds based on over-all efficiency, both in terms of cost control and risk management, and historical consistency of performance. For additional information about the AMVR and the calculation process itself, visit our web site, “The Prudent Investment Fiduciary Rules (iainsight.wordpress.com). To view the latest AMVR forensic analysis of “Pensions & Investments,” top ten non-index funds used by 401(k) plans visit our SlideShare presentation. Those statistics do not even tell the whole story. One of the most currently discussed investment issues internationally is the impact of “closet index” funds. Closet index funds are mutual funds that hold themselves out as providing active management and charge higher fees than index funds based on such claims. However, the truth is that actively managed mutual funds often closely track the performance of a comparable index fund or market index, often even underperforming the index fund due to their high costs. Higher fees for less return than a comparable index fund, essentially a net loss for an investor. Definitely not a scenario that furthers ERISA’s purposes. And yet, the issue is rarely addressed by courts involved in ERISA excessive fees/breach of fiduciary duty actions, even though the evidence clearly shows that closet indexing is definitely a problem in the United States, one which unfairly reduces the end-returns of investors and pension plan participants. 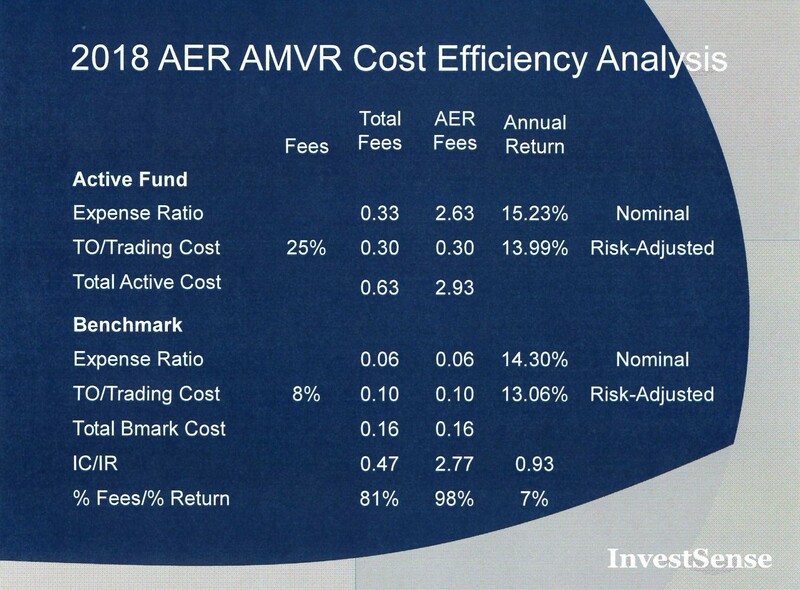 The AMVR factors in Ross Miller’s Active Expense Ratio (AER) metric.11 The AER uses a fund’s R-squared number to calculate the active component of an actively managed mutual fund and the resulting effective annual expense ratio an investor is paying on an actively managed mutual funds. The AER calculation allows pension plan fiduciaries and plan participants to evaluate the impact of the actively managed funds’ extra costs on the funds’ cost-efficiency. In our example, the impact of RGAGX’s high R-squared number/closet index factor, 95, can be seen in the fact that RGAGX’s AER number rose significantly and the percentage of the incremental fee as a percentage of the fund’s overall fee rose to approximately 98 percent of the fund’s overall fee. Does the selection of a closet index fund breach an ERISA fiduciary’s duties of loyalty and prudence, given the combination of the fund’s higher annual expense ratio with returns more attributable to the market than the fund’s management? Since the performance of closet index funds are the same (or in most cases slightly less due to the fund’s higher fees and costs) as comparable index funds, is it prudent for an ERISA fiduciary to pay the closet index fund’s higher fees and costs? Are a plan’s investment options in the “best interest” of a customer if the historical performance of the recommended investments indicated that such investments were not cost efficient and/or would have failed to provide any inherent value for a customer, i.e., would have failed to produce a positive incremental return for a customer, at the time the recommendations were made? If the goals of ERISA are to be achieved, namely protection of plan participants and promotion of their “retirement readiness,” shouldn’t the inherent value of a retirement plan’s investment options in terms of benefits provided, particularly a fund’s cost-efficiency, be the overriding issue rather than the business platform chosen by a mutual fund company? The issue with actively managed mutual funds is that the evidence clearly shows that historically, the majority of actively managed funds are not efficient, either in terms of performance or costs, as a large majority of actively managed mutual funds consistently underperform comparable, less expensive index mutual funds, thus failing to meet the fiduciary standards established by the Restatement. Plan sponsors and other investment fiduciaries would be well-served to properly evaluate their plans in order to ensure they have a truly ERISA compliant pension plan, thereby minimizing their risk of personal liability exposure. 5. Mark Carhart, “On Persistence in Mutual Fund Performance, Journal of Finance, 52, 57-82. This entry was posted in 401k, 401k compliance, 401k investments, 403b, 404c, 404c compliance, closet index funds, compliance, cost consciousness, ERISA, ERISA litigation, evidence based investing, fiduciary compliance, fiduciary law, Fiduciary prudence, fiduciary standard, investment advisers, investments, pension plans, prudence, retirement plans, wealth management, wealth preservation and tagged 401k, 401k compliance, 403b, 404c, 404c compliance, Active Management Value Ratio, AMVR, best interests, ERISA, evidence based investing, fiduciary, fiduciary law, Fiduciary prudence, fiduciary standard, investment advisers, pension plans, prudence, retirement plans, RIA risk management, risk management, wealth management, wealth preservation. Bookmark the permalink.